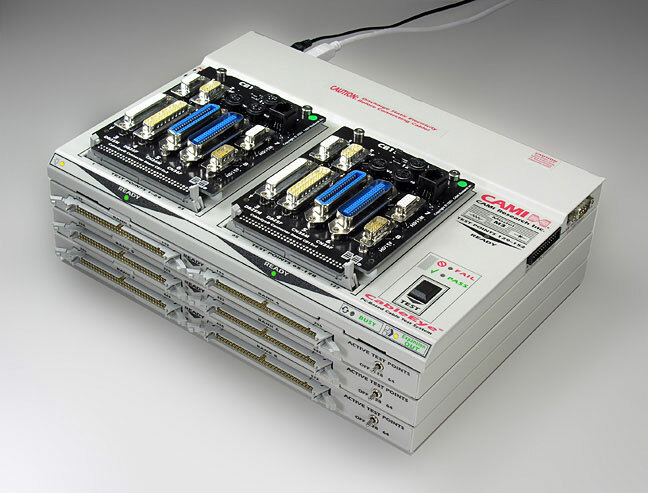 This photo shows three Attached Expansion Modules (AEX) connected to a Control Module (in this case an M3U, Item 821). The system pictured here provides 512 test points. When in use, you would attach 64-conductor flat cable to the headers on each expansion module. The flat cable would then extend to a custom-designed fixture or mating harness accommodates your multi-headed cable or wiring harness. You may also replace the two CB15 boards shown in the photo with 64-conductor flat cables. We can supply pre-assembled and tested sections of flat cable with 64-pin sockets (Item 854) if you would prefer not building them yourself. You may order your system with the number of modules you need now and add more modules at a later date. A computer is required even though one is not shown in this photo. 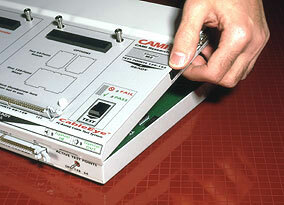 Note: Adding expansion modules to an M3U-series or M4 tester requires recalibration! Calibration is included in the purchase price.